Bundled in the warmest clothing I own, at least I’m snug while speeding across snow-covered trails and onto the Chena River, covered with a layer of 2-foot-thick ice. The old sofa cushion on which I’m seated helps smooth the ride. Ice crystals, kicked up by the 40 paws of 10 sled dogs, pepper the exposed parts of my face. But behind my woolen scarf is a broad smile; this adventure is the stuff of bucket lists. Romping along familiar paths, the dogs – with names such as DJ, Eli, Hickory and Venus – seem oblivious to the 3XL load I’ve provided them. It’s not only the dogs that are hardy. So, too, are the people in Alaska’s interior who endure long, dark and shockingly cold winters. In January 1934, the air temperature – the wind chill index wasn’t yet invented – plunged to minus 66 degrees. Subzero temps are so common that Fairbanks schools don’t keep kids indoors for recess unless it’s at least 20 below. Rather than spending their time reading a book by a warm fire, visitors venture outdoors, day and night, to enjoy pursuits from dog sledding to skiing and snowshoeing to soaking in steaming-hot spring water. But the granddaddy of all winter activities is viewing the northern lights. In the winter months, the lights are woven into the fabric of life in Fairbanks. 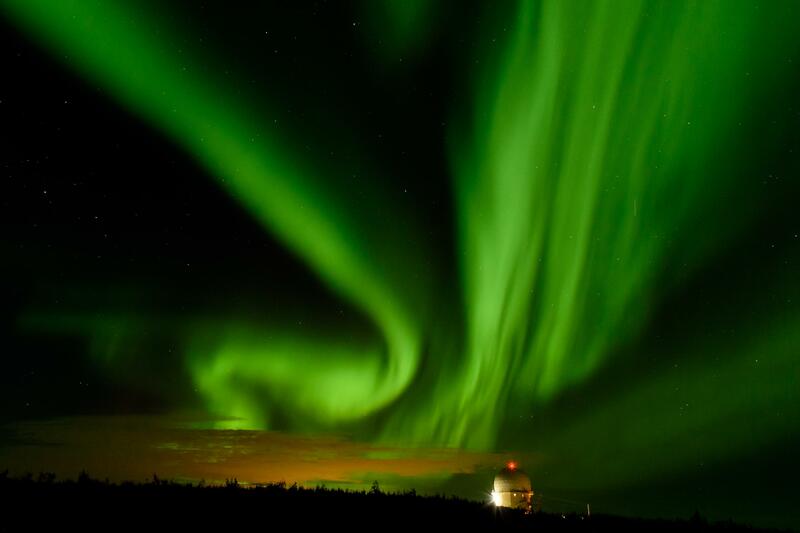 TV stations provide forecasts for the aurora borealis, the phenomenon’s formal name. An aurora borealis tracker on Explore Fairbanks’ website has real-time information on the best viewing sites in season, mid-August to mid-April. And many hoteliers offer middle-of-the-night wake-up calls when wisps of colorful lights are dancing across the blackened sky. The vivid celestial tapestry lured retiree Fred Fowler to sub-Arctic Alaska from his home in suburban Forest View, Illinois. An avid amateur photographer, Fowler, his brother and a guide spent five nights chasing the sometimes-elusive lights. They traveled in different directions each night, seeking cloud-free spots. “The key to getting aurora shots near Fairbanks is a willingness to drive well away from the city lights, find a nice dark spot away from highway headlights, check the sky for stars and then wait,” Fowler said of his successful strategy. He returned home with a slew of memorable photos. Twenty-five miles north of the city’s light pollution, the new Borealis Basecamp offers a more relaxing aurora experience. Geodesic domes – priced at $599 a night – feature clear ceilings, allowing more-sedentary travelers to eye the swirling lights without so much as getting out of bed. Fairbanks is a one-hour flight north from Anchorage. Scenic alternatives entail at least a six-hour drive along the desolate-in-winter Parks Highway or a 12-hour ride on the Alaska Railroad. The Fowlers opted for the train. Despite being the slowest mode of transportation, the train provides plenty of conviviality, coupled with tasty meals made to order in the dining car. The daylight hours offer jaw-dropping views. “Moose on the left,” guide Amanda Collins announced as passengers’ necks craned and cameras came out. The huge animals were easy to spot as they bounded through chest-high snow. Collins also said that, on any given day, winter riders might possibly join what’s called the 30 Percent Club – if they’re lucky enough to see Denali, North America’s highest peak. More often than not, though, it’s shrouded in clouds. “The northern lights are everything,” Chena owner Bernie Karl said of his winter business. While aurora viewing occupies the nighttime, other activities await during the day. Bold guests draw curious glances from the uninitiated as they don swimsuits – even when it’s well below zero – for a plunge into the resort’s namesake hot springs. Swapping swimwear for long johns and other winter gear, visitors view the art of Heather and Steve Brice at the lodge’s Ice Museum. “It feels like a heat wave when you walk into the Ice Museum when it’s 40 below outside,” Heather Brice said. First built in 2003, the original museum melted due to an inadequate cooling system. Its replacement, constructed with 1,000 tons of ice and snow, has stayed frozen since 2005. Inside, people view the couple’s ever-changing displays of ice art. Past creations by the world champion ice sculptors have included everything from native critters to snowmobilers astride their machines. If they’re lucky, guests can also watch as the Brices carve new pieces from crystal-clear blocks of ice, harvested from area ponds. Even though guests sleep fully clothed inside sleeping bags, Bernie Karl said many visitors retreat to heated hotel rooms after just two or three hours. For several weeks each winter, it’s possible to view ice sculptures without ever leaving Fairbanks. The World Ice Art Championships invites artists from around the world to create frozen masterpieces. This year, more than 100 giant carvings will be showcased Feb. 14 through March 31 at the Tanana Valley State Fairgrounds. “March is my favorite month,” said Schlentner, the dog musher and Fairbanks native.